And, what’s more sparkly and refreshing than a Mojito? Yes, myMEGusta is totally jumping the gun here, but the Connecticut thaw is making her think of seasonal pleasures ahead. For the uninitiated, a Mojito is simple, IF you have the right ingredients: white rum, sugar (or simple syrup), lime juice, seltzer water and fresh mint, over ice. There are only two tricks: finding the good mint, and crushing the leaves just enough to release the aromatic oils, but not enough to macerate it and make a mess. 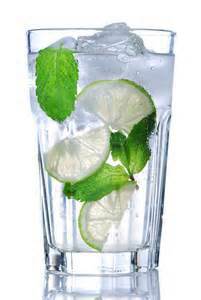 It’s a tall drink, and the sipper can vary the strength by adding more, or less, water. Here’s a link to a recipe: http://allrecipes.com/Recipe/The-Real-Mojito. If you’re curious about variations, even on the classic formula, you can check any major rum company website, and you’ll find some, of course with their brands. 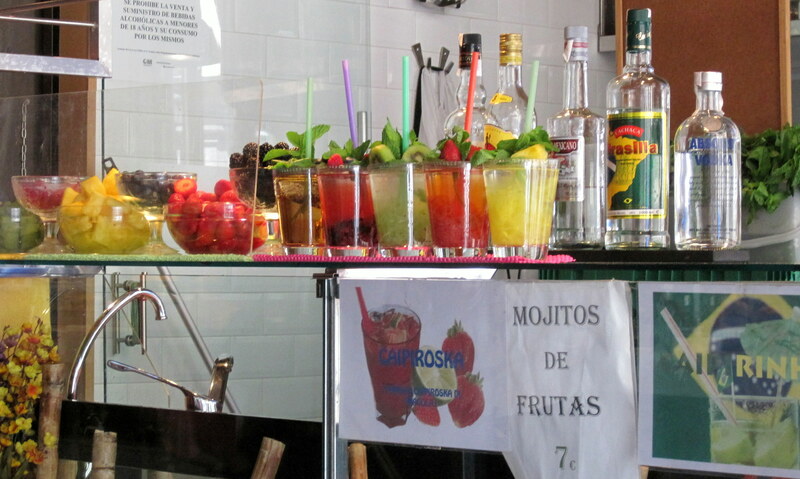 Mojitos are also made with other fruit juices and purees, in addition to (or substituting for) the lime juice. They are also available pre-mixed, but myMEGusta has not gone there, and probably won’t unless a reader give them a really high endorsement. Invented in Cuba, the Mojito was a favorite drink of Ernest Hemingway, and his number one place to enjoy one was La Bodeguita del Medio in Havana, reputedly a big tourist destination now as a result of this. World traveler readers, care to comment on that? But it’s not just a libation for the Americas. 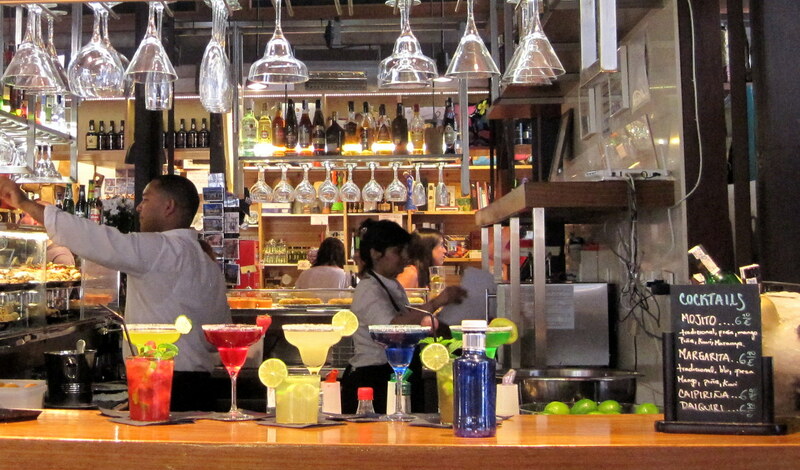 And, when you visit the Mercado de San Miguel in Spain, you find Mojitos among other fruity refreshers prominently featured at the main bar, and a rainbow array on the other end of the building on a stand devoted entirely to Mojitos made with various fruits and spirits. Unfortunately, myMEGusta’s market visit was too early in the day to allow for sampling. Here’s a hint on the mint as you prepare for a summer’s worth of delicious Mojitos: Freshly harvested mint is often one of the first herbs to appear at farmers markets in the spring. Purchase a bunch, enjoy your first Mojito of the season with a few sprigs, and put the rest in a glass of water to further develop the roots (or just buy a little plant). 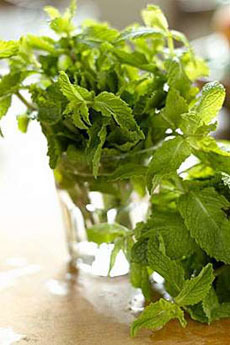 Once they look lively, growing a little bit, plant the mint in a shady place, and enjoy it all season. If you are lucky, it may even spread, and be a handy resource for years to come, both for delicious cocktail hours and for fresh mint tea anytime. Thanks so much for your mojito message and reminder that our seemingly endless winter will soon be filled with “summer pleasures” such as the mojito – definitely one of my favorites too!!! Good blog although it is cold and rainy today. Better days are coming and mint will sprout very soon. I have mint in many places on my property and is spreading like a perennial weed. I can’t drink so many mojitos, but can use it in ice tea, in Mint Sauce, and give away to neighbors. Deer don’t like my mint, and prefer roses.